If you're contemplating a visit to Yellowstone National Park, you may have a few of questions on when to go, what to do, and where to stay. Here are some answers to help you get started with your travel and recreation plans. July and August are the peak travel months, when the weather is most likely to be warm and dry. If you wish to avoid the crowds, June and September are a good choice but you do run the risk of cooler, wetter weather. The Mammoth and Old Faithful areas are open during the park's winter season, which runs from late December until March. The typical Yellowstone National Park experience involves driving from stop to stop, taking in the scenery along the way and stopping every now and then to watch the wildlife. At your stops, you'll get out and wander or hike to get a closer view of the thermal features and other attractions. You'll want to spend time at the visitor centers and historic areas, as well as exploring the historic lodges and other "parkitecture." Outdoor activities include hiking, boating, fishing, horseback riding, and cross-country skiing. Wyoming's Grand Teton National Park is located just south of Yellowstone National Park, so if you have the time, take advantage of the opportunity and visit both parks. One park admission fee gets you into both. If you're looking for modern amenities like television, internet access, and air conditioning, your best bet is to stay in one of the communities just outside the park. If you can live without those things, and have the time and the funds, I recommend staying at two or three different hotels inside the park as you visit the park's different regions. No matter what kind of lodgings you choose, advance reservations are highly recommended. The hot springs in Yellowstone National Park are not the kind that you want to soak in. 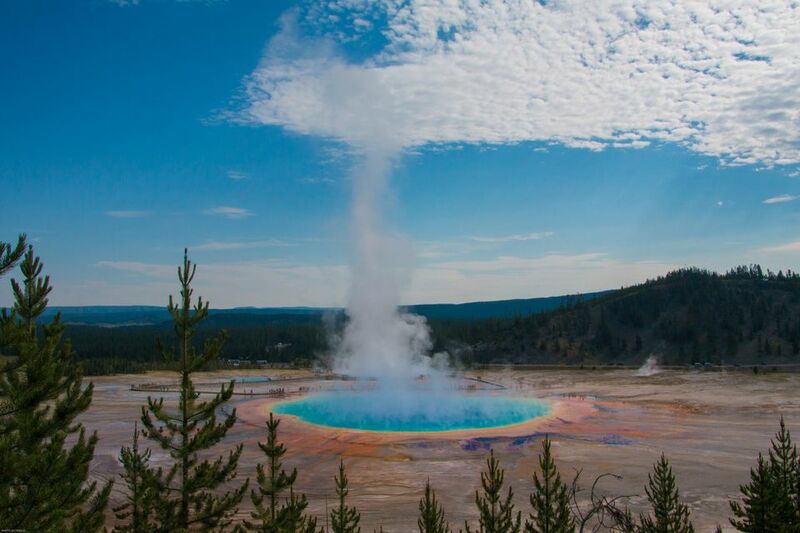 The magma beneath Yellowstone is closer to the surface than anywhere else on earth. This molten rock superheats the underground water and creates the park's hot springs and geysers. Yellowstone's geothermal features are both fragile and dynamic, so you don't want to get too close. Stay on the boardwalks or marked trails. Because of the danger and the sensitivity of the thermal features, swimming or bathing in strictly prohibited. Dogs are allowed in some areas of the park but must be kept under strict control. Even when crated or on a short leash, the only areas where they are allowed are your car, the parking lots, and campgrounds. Unless yours is a service animal, save yourself and your canine companion a lot of stress and leave him or her home. Dogs are most definitely not allowed near wildlife or thermal features. You know those hot springs, while blue and enticing, are filled with scalding water, but your dog does not. The following airports have regularly-scheduled service from major airlines throughout the US. Unlike many national parks, Yellowstone offers a range of visitor services inside the park. Stations that offer both gas and vehicle repair are located at Canyon Village, Fishing Bridge, Grant Village, and Old Faithful. Fast food, counter service, and cafeteria style dining is available throughout the park. Sit-down dining includes Mammoth Hotel Dining Room, Old Faithful Inn Dining Room, Old Faithful Snow Lodge Restaurant, Lake Yellowstone Hotel Dining Room, and Grant Village Lakehouse Restaurant. There are a dozen Yellowstone General Stores located within the park near campgrounds and lodging. In addition to basic groceries and snack foods, they also offer ATMs, gift items, clothing, and sporting goods. The Yellowstone General Stores also stock items frequently required for camping and outdoor recreation. Yellowstone Association stores are located at Canyon Village, Fishing Bridge, Grant Village, Madison, Mammoth, Norris, Old Faithful, and West Thumb.